Yoho National Park is one of the four national mountain parks that make up the Rocky Mountain Parks UNESCO World Heritage Site. The other mountain parks are Banff, Jasper and Kootenay. "Yoho" is derived from the Cree Language meaning awe and that’s just what this Canadian jewel is . . . awesome! The park is filled with spectacular scenery, including more than twenty snowcapped peaks reaching heights of over 3,000 meters (10,000 feet), azure green glacier lakes, cascading waterfalls, and energetic rushing rivers and streams. Yoho is also known for the vegetation and animal life is supports. Situated in British Columbia on the western slopes of the Rockies, Yoho, like Banff and Jasper owes its origin to the railway. Little is known about the Yoho region prior to1858, when James Hector explored the area for the Palliser Expedition (formed to explore western Canada). The aboriginal inhabited this region some 2,500 years ago, but this evidence is limited. Surveyed in 1881 by Major A.B. Rogers, the railway selected Yoho as the route to link east and west, with the first train crossing Canada in the year 1886. Until 1909, when the Spiral Tunnels were built, Located on the east side of Field was a steep grade know as the Big Hill which created many problems and cost the railway money. Finally in 1909 the railway solved the Big Hill issue when they constructed the Spiral Tunnels. This region starting opening up to the public, when the CPR built lodges, created trails and offered guided mountaineering services to the tourists. Mt. Stephen House in Field was the first rockies hotel built by the CPR and 16 square kilometres near the mountain were set aside and was originally called The Mount Stephen Reserve. More area was added including Yoho Valley and in the early 1900’s this region became known as Yoho Park Reserve, and a few years later it achieved National Park ranking. Yoho National Park today covers an area of approximately 1,300 square kilometres and by 1958 the Trans Canada Highway # 1 was completed, replacing the Kicking Horse Trail, making this area available to thousands and thousands of people. Within the park boundaries is one of the most important fossil sites in the world, known as the Burgess Shale. This 530-million year old site is an ancient seabed and contains more than 120 different marine species that are perfectly preserved. The research being done today on these fossils is taking on a different approach to the early evolution of animal life. In 1981, the Burgess Shale became an UNESCO World Heritage Site. The area is well protected because in 1984 UNESCO proclaimed the four National Parks along with the bordering provincial parks as the Rocky Mountain World Heritage Parks. The Burgess Shale is a World Heritage Site, within a World Heritage Site. 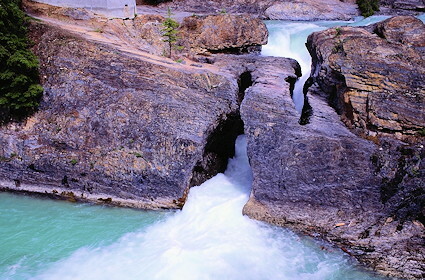 Hiking and backcountry trekking are very popular in Yoho National Park and there more than 400 kilometres (240 miles) of trails accessing the many remote regions. If you enjoy mountaineering and climbing you must have a permit to traverse the restricted areas and there are guides for hire to take you and your party into the high wilderness regions. Mountain biking is allowed on designated trails. 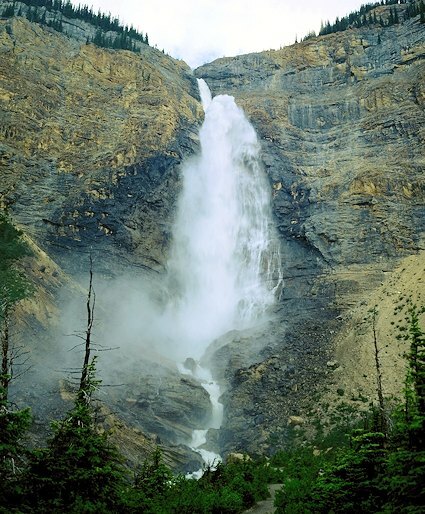 Spectacular natural beauty abounds in Yoho National Park, where you might spot rare orchids, flowering alpine meadows, rushing streams and Takakkaw Falls, one of the highest waterfalls in Canada, free falling for more than 250 meters (800 feet). Emerald Lake surrounded by towering mountains is a very popular tourist destination with lodge facilities. The lake basin and high mountains attract frequent rainstorms in the summer and heavy snow falls in winter. This moisture is the reason you will find typical BC wet interior forests and the many species of wildflowers around the lake area. 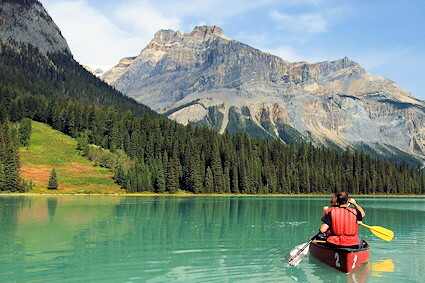 Hiking, trail riding, canoeing and fishing are all popular activities at Emerald Lake. Lake O’Hara is a mountain retreat drawing visitors from all over the world. The rough peaks, the many lakes and alpine meadows keep the tourists coming. But you must have reservations in advance to stay overnight in the lodge, cabins or campground and to ride the bus. The road is not open to public vehicles or bikes, but you can hike in. Make sure you book your reservations well in advance. Whether you come to Yoho National Park to enjoy the many outdoor recreational activities or you wish to only go sight seeing, it has everything to make your outings unforgettable. Yoho truly is awesome! The village of Field, BC (in the park) is where you will find the visitor service centre and information on Yoho National Park.